Nearing the temple of Tungnath. November 2016. That is the thing with trekking. It always starts off sweetly, turns bittersweet in a matter of minutes, then just plain bitter, but ends in the sweetest way possible. If you have trekked before, you know this to be true. If you have consciously tried to stay away from any kind of activity that involves walking, or if you don’t mind all that but haven’t yet somehow gotten down to it, THIS WILL COME TRUE. Now since you are reading this, I assume you are ready slip into the shoes (you will need a good pair of trekking shoes) and get down to business. That is why it is important that you choose your first trek wisely and not end up biting off more than you can chew. Hence, Chandrashila. The gateway to the many colours of bugyals and forests it’s nestled in, along with the many shades and shapes of The Greater Himalaya. Be it the distance, difficulty level, the ease of availability of food and water, and the ever so grand Himalayan panoramas; it has everything going for you to make your first trek an unforgettable experience. Conditions and Fitness May Apply! Nearing Bhujgali Bugyal. Chaukhamba peeking out in the background. September 2017. Given the state of social media to share and promote anything in plain sight, it’s very unlikely that you haven’t heard of Chandrashila. In case you haven’t, it’s time to get out from under the proverbial rock and summit the actual one – ‘Moon Rock’, aka Chandrashila. Chopta (Uttarakhand) is a popular ground for weekend campers and surely, you must have heard of it. The trek to Tungnath, a famous religious shrine (one of the Panch Kedar), begins from here. Chandrashila summit is further up from Tungnath. Nearing the Temple of Tungnath. The highest peak that you see on centre-right, its summit is Chandrashila and that is where we have to go. May 2016. Jaonli, Gangotri, Jogin, Thalaysagar, Bhartekunte, Rock Tower, Kedarnath, Kedar Dome, Sumeru, Kharchkund, Yeonbuk, Bhagirathi, Mandani, Satopanth, Swachhand, Janhukut, Chaukhamba, Balakun, Hathi-Ghodi Parbat, Barmal, Gorur, Tirsuli, Hardeol, Dunagiri, Nanda Devi, Nanda Ghunti and Trisul. Left to Right – Jaonli to Chaukhamba. Midway Panoramas. September 2017. From Chopta to Chandrashila, the distance is approximately 5.5 km and if you start early, you can return to Chopta by the evening. The first 4 km till Tungnath is a gradual yet easy ascent. The path is paved and straight forward. Call it prepping up for the real thing. Because after Tungnath is where you really get into the scheme of things. The paved path ends and gives way to a broken trail that will lead you to Chandrashila. Although it’s steeper and more challenging, it’s hard to miss. Follow it and you will be absolutely fine. 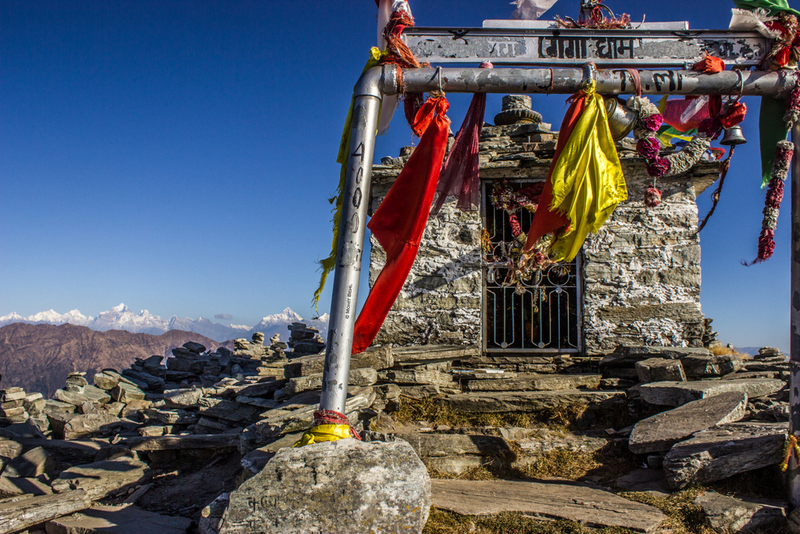 Be wary of the altitude sickness that might creep in; Tungnath is the highest Shiva Temple in the world at a little over 12,000 ft. and Chandrashila at around 13,000 ft.
Take it easy and pace yourself. It’s not a race. From where the trek starts to Tungnath, you will find small dhaba-like shacks that appear at regular intervals and offer food, water, cold drinks, juices, milk and packaged junk. You are pretty much sorted there. However, if the temple of Tungnath is closed for the winter, you will find most of these shacks closed, save for a few at the starting point. It is advised that you have a hearty breakfast there, get some packed for the way, and carry enough water to stay hydrated through the day. Bhujgali Bugyal. Less than 1 km after starting the trek. A stopover for food, water and refreshments. November 2016. If you prefer camping, you can either pitch up your own tent or ask the roadside shacks to pitch one up for you. The rates for the rooms and tents are more or less the same, depending on the season and number of tourists present there on that day, which is anywhere between 400-800 per person. You can also trek to the temple and pitch a tent nearby or stay indoors; there are a few lodges surrounding the temple premises. Although this is an all season trek, it should not be done without professional help from the guide or without proper equipments in the harsh winter when snow nearly covers the entire path, making it riskier to find a path on your own. For a comprehensive guide to Deoria Tal-Chopta-Tungnath-Chandrashila, watch this space for more. Meanwhile, here are some parting shots. Baniyakund, 3-5 km before Chopta. A fine place to camp or rent out semi-luxury tents. May 2016. Shot from Chandrashila in November 2016. Jaonli (6632 m). Shot from Chandrashila in November 2016. Thalaysagar (6904 m) and Bhartekunta (6578 m). Shot from Chandrashila in November 2016. Kedarnath (6940 m) and Kedar Dome (6831 m). Shot from Chandrashila in November 2016. Bhagirathi I (6856 m). Shot from Chandrashila in November 2016. Mandani I (6193 m) and Mandani II (6001 m). Shot from Chandrashila in November 2016. Satopanth (7075 m), Swachhand (6721 m) and Janhukut (6805 m). Shot from Chandrashila in November 2016. Chaukhamba I (7138 m) to Chaukhamba IV (6854 m). Shot from Chandrashila in November 2016. Ghodi Parbat (6708 m) and Hathi Parbat (6727 m). Shot from Chandrashila in November 2016. Tirsuli West (7035 m) and Hardeol (7151 m). Shot from Chandrashila in November 2016. Dunagiri (7066 m), Kalanka (6931 m) and Changabang (6864 m). Shot from Chandrashila in September 2017. Nanda Devi (7816 m) and Nanda Devi East (7434 m). Shot from Chandrashila in November 2016. All three peaks of Trisul I (7120 m), Trisul II (6690 m) and Trisul III (6008 m). Shot from Chandrashila in November 2016. Hathi-Ghodi Parbat to Trisul. Shot from Chopta in November 2016. Chaukhamba basking in the light of the full moon. A long exposure shot.